What are the symbols in the Eagle Bucks slot? As stated above, the theme is American wildlife, so the usual fauna is here: elk, wolves and the like … plus, the playing card symbols A, K, Q, J, 10 and 9 join the fun with their vapidity. A shield (?) is the scatter symbol, while the (yawn) game logo is the wild. Are there bonus feature rounds in Eagle Bucks? Sure; this is the 21st century, after all! Pretty standard stuff here, too, actually. Land three scatters on a single spin in the usual fashion and you’re rewarded with 10 freebies. An additional perk is provided via stacked wilds to beef up the ol’ winnings a bit during free spins. Oddly, the game designers/developers at Ainsworth saw fit to include a “gamble feature” in this game. Since this so-called “bonus feature” has mercifully become nearly extinct, we’ll briefly state that this is a chance to risk a 2x or 4x reward slapped onto a win earned from the spinning reels. We’ll also add that this “feature” is at best a silly way to lose more playing money on a non-slots game. How much can I bet in Eagle Bucks? Eagle Bucks has 20 paylines, with per-payline bets of various increments between 1¢ and $12.50 for a single spin. 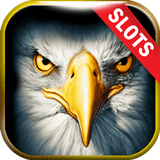 Eagle Bucks somewhat eccentrically also offers what other slots games might call “levels”: The player may wager on 1, 10 or 20 paylines and why would anyone wager on a single payline in a 5-reel slot machine…? What’s the highest payout in the Eagle Bucks slot? For a single payline, the largest jackpot payout the Eagle Bucks slot awards is 1,000x the payline bet. During the free spins round, stacked wilds could theoretically produce a win of 30,000x the payline bet, which works out to a fat $375,000. Now that’s what we call Eagle Bucks! How do free spins go in Eagle Bucks? Ten free spins are awarded for tripping three or more scatters on a single spin of the Eagle Bucks slot game. The major difference here is that the stacked wilds become expanding wilds. Note, however, that the expanding wilds only occur in the middle three reels, a.k.a. reels 2, 3 and 4.